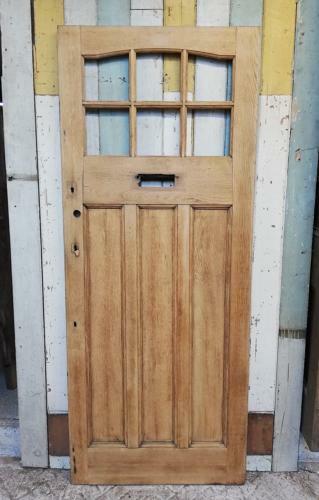 A very attractive oak front door, dating to the late Arts and Crafts period, with classic Edwardian design. The door has been stripped to bare wood, and has a lovely colour and grain. The door has mouldings and vertical panels. The door has attractive panels at the top, ready for glazing. We can glaze the door for an EXTRA CHARGE. Please contact us to discuss your requirements and for a quote. The door hardwear has been removed and there is space for a letter box below the glazing panels. The door is ready for finishing by purchaser, with perhaps a varnish or paint, however we feel oil, suitable for exterior use, is most ideal for the door. The door also requires hardwear, to be supplied by purchaser. The door is reclaimed and therefore has some signs of wear. There are some stains, marks and scratches. There are some slight colour variations in the oak. Some holes and marks where the door hardware has been removed and some staining and chips around the letter box hole. Some slight knocks to the edges and corners. There are some visible puttied wood knots. The door is solid, with great style, ideal for a period home. The oak is of a fantastic quality and the door is rare to find in hardwood.